There are few pieces of cookware as versatile and dependable as a good cast iron Dutch oven. Finding the right one can be the beginning of a many delicious memories shared around the dinner table with family and friends. As a rule, cast iron cookware has a tendency to last forever, so there are a couple things you’ll want to consider before making a selection you could end up living with for years. For starters, there are two types of cast iron cookware available: “regular” and enamelled. Regular cast iron is the traditional black, heavy-duty version that held a place of honour in your grandmother’s kitchen. Regular cast iron is considered either “raw” or “pre-seasoned.” Today, most new cast iron on the market comes already seasoned, which means you don’t have to worry about treating it before use. On the other hand, enameled cast iron is coated with several layers of really tough, smooth porcelain. This durable porcelain surface means there is no need to season (or protect the pre-seasoning) on your investment like you do with regular cast iron. For this reason, enameled cast iron provides a definite convenience factor for busy home cooks. Unlike regular cast iron, however, the enameled versions cannot be used outside on open flames or on the grill. This coated surface makes cleanup a breeze. It also means that enamelled cast iron is not reactive to food, so it is safe for tomato sauces and other acidic dishes that can be problematic for regular cast iron. Although enamelled cast iron is heralded for being dishwasher safe, most manufacturers recommend hand washing your pieces in warm soapy water instead. Enamelled cast iron cookware has become very popular in recent years due to its stunning good looks. Pricey enamelled cast iron by Le Creuset has become a status symbol thanks, in part, to a gorgeous palette of eye-catching designer colours. Enamelled cast iron is perfect for one-pot meals because it can be go from hob top to oven to dinner table – and look great in the process. However, the high price tag found on Le Creuset pieces is a big deterrent for a lot of people. Fortunately, there are more affordable options available that are worth a closer look. One option that stands out is the Lodge enamelled cast iron Dutch oven. Lodge is a well-known and highly respected name when it comes to cast iron cookware. They’ve carved out a distinguished place in that market over the last 100 years, thanks in large part to their tough-as-nails regular cast iron products. Lodge offers affordable enamelled Dutch ovens in several sizes, as well. You can currently choose from 3.0, 6.0 and 7.5-quart sizes on Amazon. The 6.0-quart option is plenty big enough to make pots of chilli, stew or soups large enough to feed a crowd. You may find the 3.0-quart version too small for many uses, while the sheer size and weight of the 7.5-quart option can make it difficult to get it in and out of hot ovens safely. All sizes currently qualify for free shipping with Amazon Prime. You can also purchase a combination package on Amazon that includes a 4.5-quart and a 6.0-quart version. Oddly enough, this package is priced at £160, while the 6.0-quart option is priced at only£60 on its own. The package appears to be only available in Island Spice Red at this time. If you really want the 4.5-quart option, I suggest tracking it down individually elsewhere. Presently, the Lodge 6 Qt. Enamelled Cast Iron Dutch Oven has received more than 4,400 reviews on Amazon, with an impressive combined rating of 4.7 out of 5 possible stars. 91% of those who reviewed it – nearly 4,000 people – feel it deserves a 4 or 5-star rating! Lodge enamelled cast iron Dutch ovens are available in 9 eye-catching colours, ranging from basic white or grey to a rainbow spectrum of bright red, orange, green, blue and purple. The versatile lid that comes with it also fits their 11” skillet, which is oven safe up to 400F. (The knob of the lid is listed as safe up to 500F, but some reviews mention that newer models now feature an ovenproof stainless steel knob instead). I’m not 100% sure what the current status is, but it is certainly worth noting if you do a lot of high-temperature cooking. 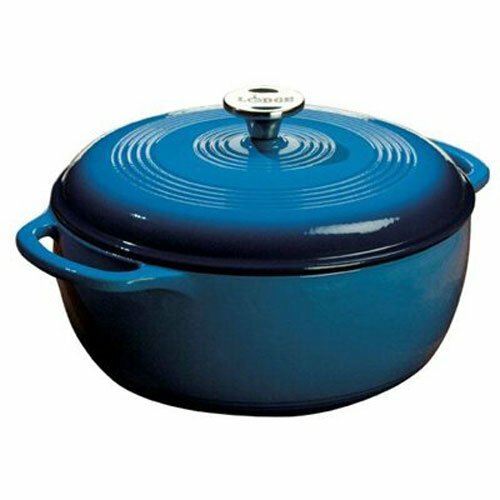 Many reviewers note that the Lodge enamelled Dutch oven has a similar look to much pricier cast iron cookware by Le Creuset. As a comparison, a 5.5-quart Le Creuset Dutch oven starts at £215, while the larger 6.75-quart option runs around £260. By comparison, a regular (non-enamelled) 5-quart cast iron Dutch oven by Lodge currently runs around £35 on Amazon, while the 7-quart option is closer to £65. The Lodge 6-quart enamelled Dutch oven is around £55. The most prominent complaints about the product involve durability issues and warranty disputes over manufacturer defects. Several noted that the enamel had worn away on the inside to expose the dark cast iron underneath. Others dislike that this product is made in China and voiced concerns about possible lead exposure. Lodge has published a clear response regarding their stringent safety testing policy in response to these concerns. Lodge Raw Cast Iron 5.0 Qts. Lodge Raw Cast Iron 7.0 Qts.